We've already spilled on how to make your visit to the Bank of America Winter Village ice rink an inexpensive night out, but what if you want a premium rink experience? We detail the tempting upgrades here. 1) Buy a VIP FastPass. Cut to the front of the line with a VIP FastPass, the best way to instantly upgrade your rink experience. Your FastPass also gets you skate rental and bag check service. At just $25 online (and $28 in-person), it is a real steal: renting skates and bag check separately cost up to $25, anyway! If you're with a group that wants to upgrade, consider a FastPass Family Four Pack. Purchase online for $100 and receive VIP admission, skate rental, and bag check, along with other fantastic upgrades: hot chocolate and a 10% off voucher at Celsius restaurant. Skating with dull blades can really be a drag, so upgrade your experience with freshly sharpened blades. For just $20, ensure a smooth and slick journey on the ice with blades as fast as Apolo Ohno's. Sparks fly as these skates get ready for business. For those who are new to skating or who want to pick up some new moves, skating lessons are the way to go. Take private, semi-private, or group lessons. Prices vary; see the Winter Village website for more details. 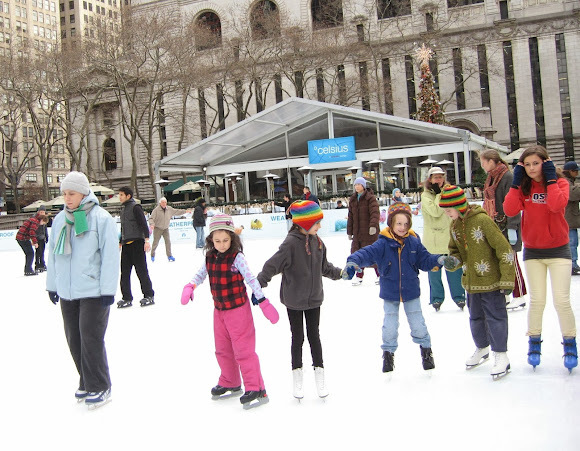 Little ones enjoy a group skate lesson. Enjoy a warm winter cocktail or a hearty meal with the best view in the park at our rinkside lounge and restaurant! Follow through for the full review.